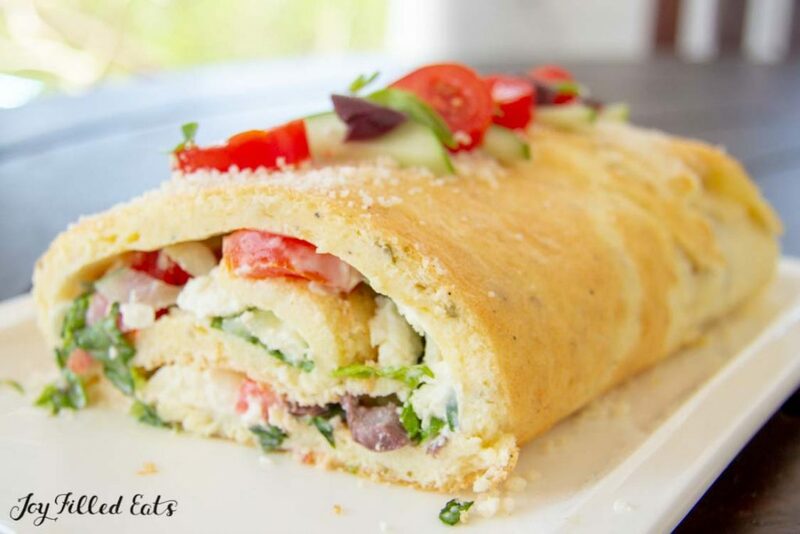 This Greek Salad Roulade Recipe is a unique take on a classic egg roulade. It is perfect to serve for brunch or a nice luncheon. With the bold flavors of kalamata olives, feta cheese, and fresh basil this is a nice change from your standard lunch fare. Hi! 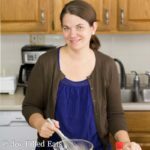 This is Angela from Divalicious Recipes. 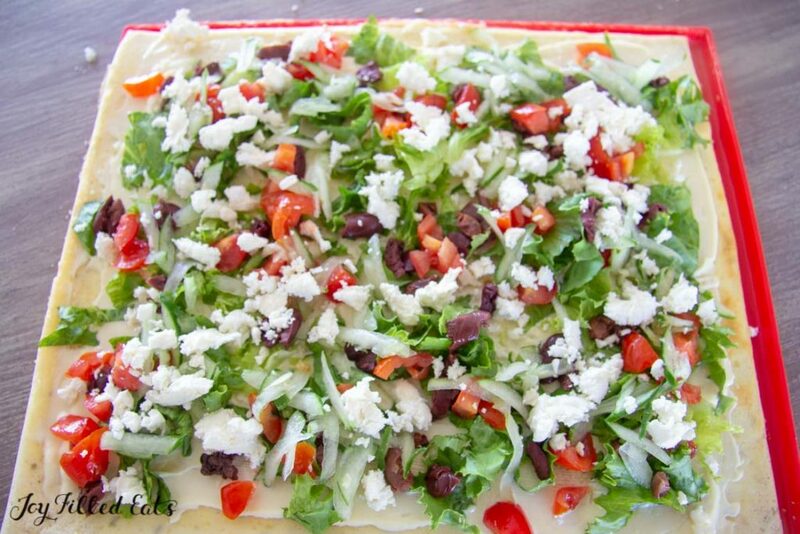 With this recipe, I have combined my love of a Greek salad along with a roulade. 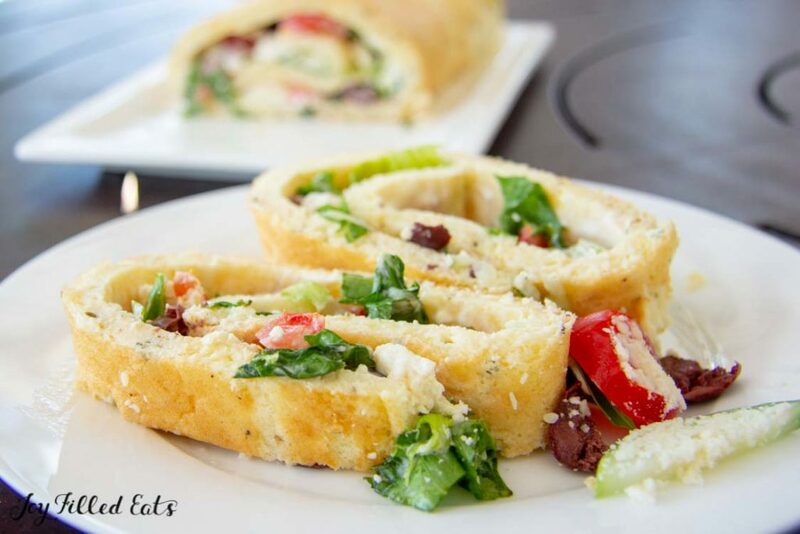 This Greek salad roulade makes a light and delicious lunch that can be enjoyed any time of the year. 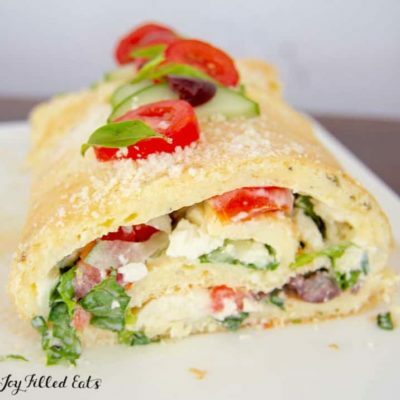 I find a roulade an elegant and easy way to serve eggs. It doesn’t take long and can be quickly assembled making it an ideal dish to make for unexpected visitors. 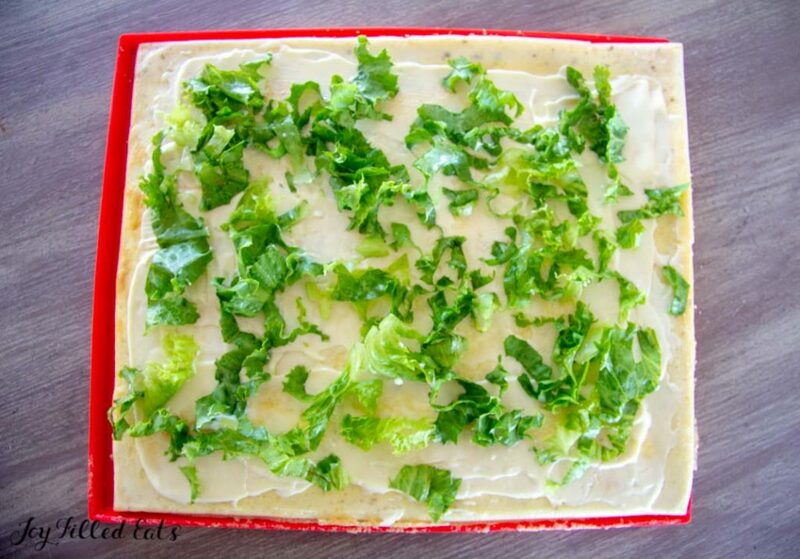 Add a salad filling and you have a great spin on an egg salad! Although Greek salad often uses lettuce it is not in the traditional recipe. But I wanted some extra crunch so used a local lettuce that is grown in St Lucia. The lettuce is like romaine but a lot cheaper! We don’t get a wide variety of lettuces since they are imported but I prefer to purchase as much local produce that fits my low carb lifestyle. You could use cream cheese instead of mayonnaise to bind the ingredients, but I enjoyed the mayonnaise as it did not overpower the flavors of the filling. You do need something to bind the ingredients when it is rolled otherwise it will fall out. 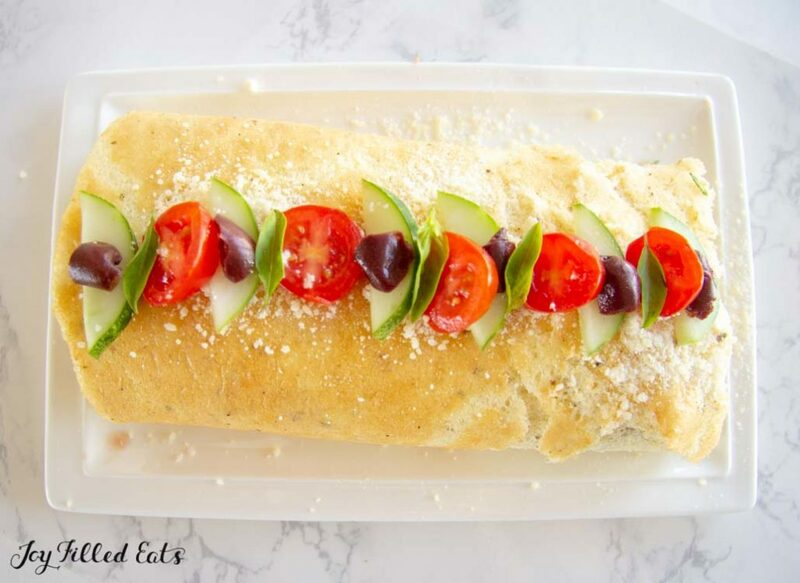 The filling is a delicious mix of olives, grated cucumber, tomato, and salty Feta cheese. I added fresh basil purely as that’s the special ingredient in my Greek salad recipe that always gets rave reviews. 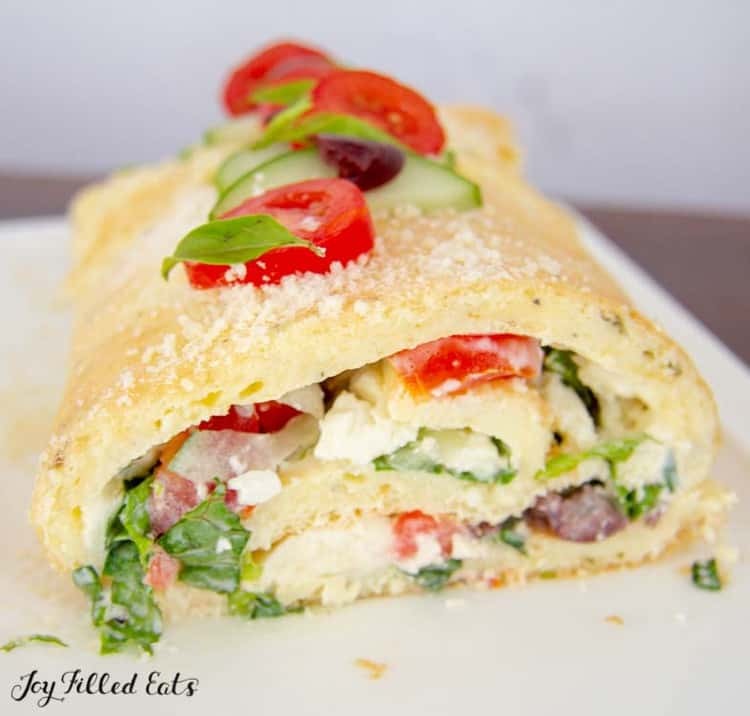 An egg roulade rolls better than a cake when cool but if the worse comes to the worse and the roulade cracks when you roll it, slather the cracks with a bit of cheese and decorated it! That’s why my chocolate swiss rolls are often slathered with an unplanned topping! Preheat the oven to 200C/400F degrees. 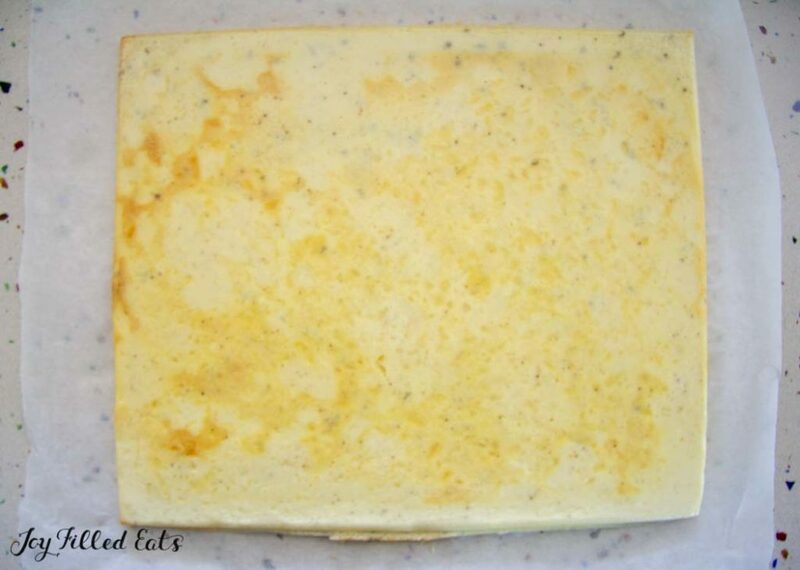 Grease and line a rectangle baking tray with parchment paper. Remove the top layer of parchment paper. Spread the mayonnaise over the roulade. Scatter the fillings over the roulade. Trim off any edges for neatness. Eat and enjoy! This is totally yummy! Will be making this on repeat! I made this to go with dinner last night and OMG everyone loved it! Thanks so much for sharing!